In general, when we think of the Olympics, we think of the very best in sport, coming together in one of the most epic celebrations. Teams from all over the world unite for a few weeks in an absolute spectacle and battle it out for as many medals as possible. 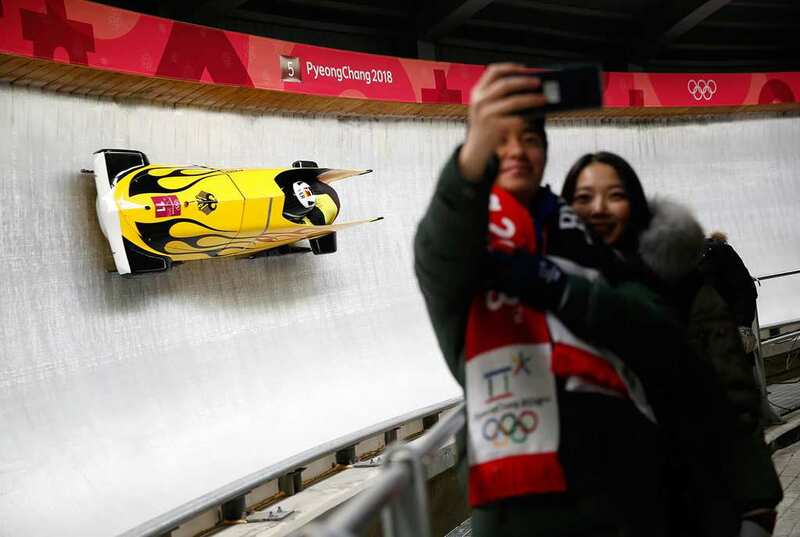 In recent times, the Winter Olympics has also become more and more popular. In virtually every aspect of life, a moment can be extremely funny depending on the angle that you look at it. 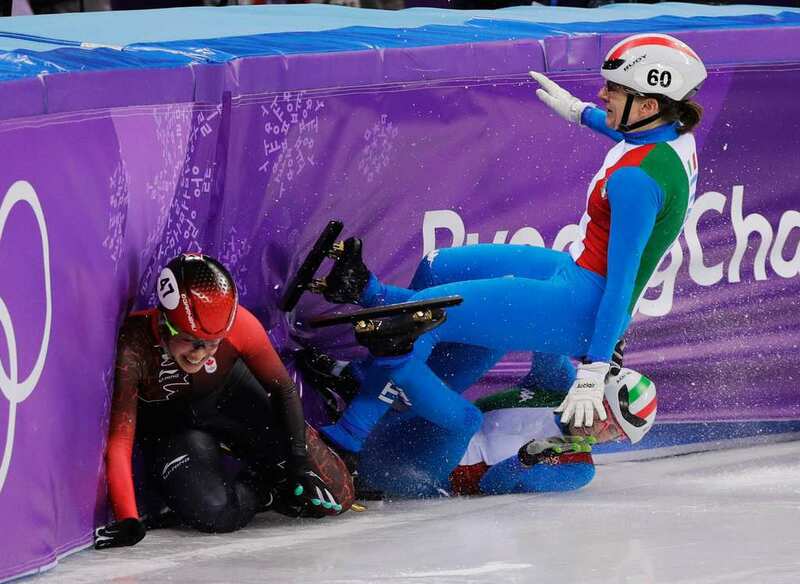 One speedskater got into a serious accident at the games. Seeing that they have made a full recovery, we don’t feel so guilty now when looking at the photo of them taking the funny-looking fall. 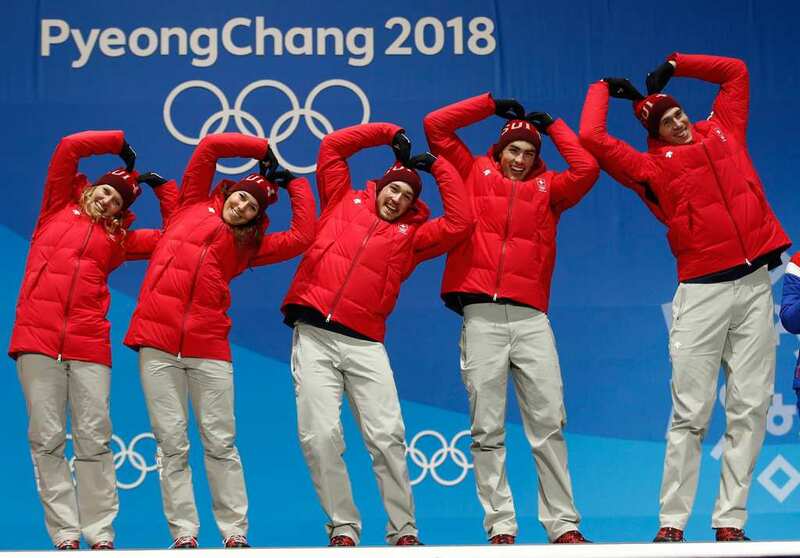 Join us as we show some of the funniest photos taken at the 2018 Winter Olympics in Pyeongchang. Bradie Tennell has been a regular representative for Team U.S. in the world of figure skating and tried her very best once again at the Winter Olympics in Pyeongchang. She certainly knows how to pull a funny face in the middle of a death-defying stunt! 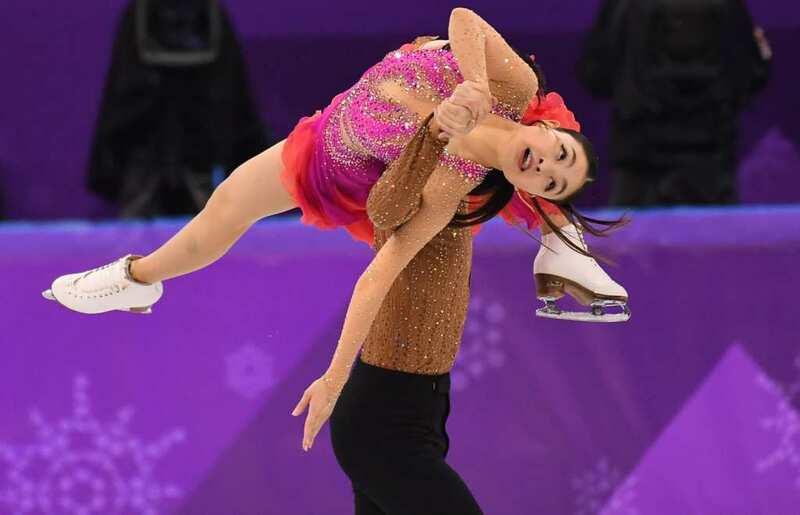 Truly, after seeing this still, we’re glad figure skaters aren’t judged on their ability to take flattering candid photos. Even the most graceful person can have the misfortune to be caught making an unflattering face. When you’re performing in the figure skating contest, you want to keep a straight face and stay in character until the very end. It is a performance, at the end of the day. However, when Scott Moir and Tessa Virtue completed their performance, representing Canada, they knew they were onto a winner. 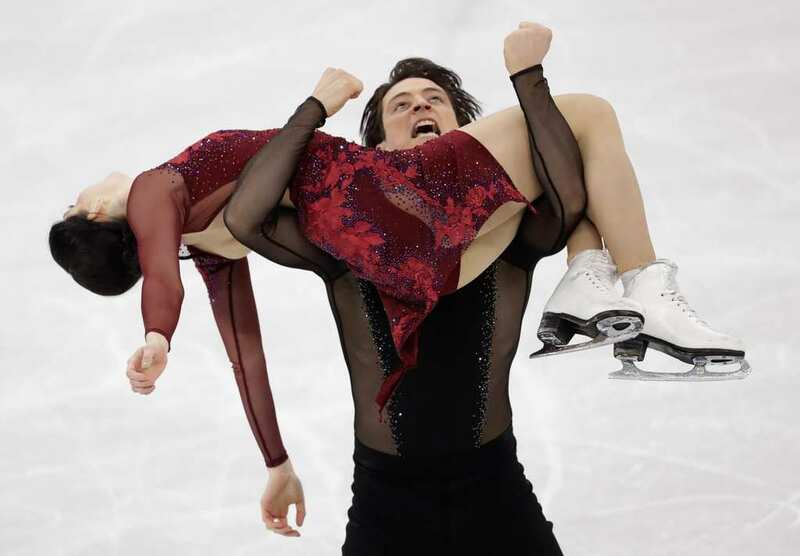 As soon as they stuck the landing, Moir held Virtue in his arms and screamed in triumph. The pair won the gold and broke the world record for overall score! 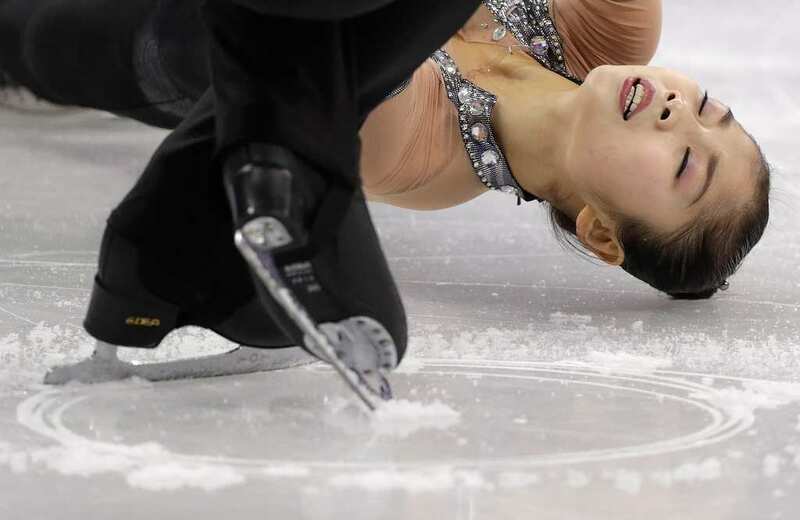 Ryom Tae Ok of North Korea could practically taste the ice as her partner, Kim Ju Sik nearly dropped her during their performance in the figure skating at the Winter Olympics. Even at the highest level, mistakes can be made. We can only imagine that if she was any lower, things could have gone horribly wrong for Ryom Tae Ok. For the Korean contestants, there was obviously a higher level of pressure to impress seeing that it was hosted in Pyeongchang. Mature beyond her young years, Alina Zagitova took the Winter Olympics by storm in the singles figure skating. Not only did she win the gold in the end, but the 15-year-old Russian made history, setting the world record for the highest score in a short program. If those statistics are anything to go by, you can expect big things in the future for Zagitova. It almost looks as if she’s flying high over the icy surface. Truly breathtaking. 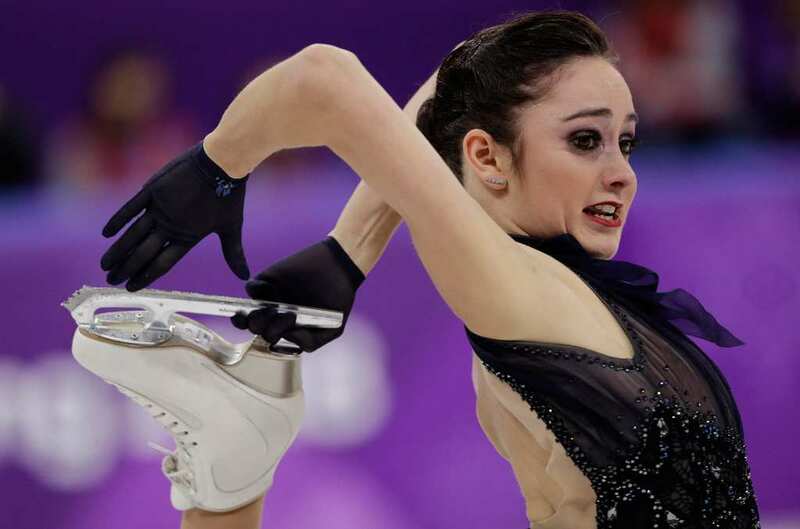 Although she ended up with a respectable bronze medal in Pyeongchang, it’s how Canada’s Kaetlyn Osmond looked as she wowed the audience and judges alike. At that pivotal moment, when she hung onto one of her skates for dear life, it almost looked as if she had been put under a spell by a ventriloquist. This was probably not the case, but one thing is for sure, this audacious stunt was bound to hurt the next morning. We can confirm that American figure skating pair Madison Chock and Evan Bates actually fell in this shot. For a moment, we weren’t too sure what was going on in this photo. This is mainly due to the angle. It creates the illusion that makes it unclear what’s going on below. There are two possibilities: either one) they fell, or two) Chock has superhuman strength and carried Bates in one arm as she did a triple spin. We have confirmation that it’s number one. It appears that Penny Coomes and Nicholas Buckland’s worlds were turned upside down when they performed at the Winter Olympics in the Figure Skating pairs. The British team performed this audacious move successfully, with Coomes’s legs wrapped around Buckland’s neck. It makes you wonder; what if Buckland would lose his balance? What would happen to Coomes? What exactly would she break? Would she break her nose, neck or jaw? Or would she break all of three? We’re glad we didn’t find out. The Shibutani Siblings, also no as the “Shib Sibs” are one of the most exciting figure skating pairs in recent memory. Maia and Alex went on to win the bronze in the games, and it’s understandable to see why after seeing this impressive stunt. It’s obvious that these two were fans of the WWE back in the day. It looks like Alex is recreating one of the those classic finishing moves that he probably practiced on her when they were kids. Regardless of whether ice skating pairs are actually in relationships or not, it’s amazing how romantic and intimate their performances can be. Not only did Canadian pair Tessa Virtue and Scott Moir win the gold in Pyeongchang, making them one of the most decorated pairs of all time. They also convinced the world that they are more than just friends with their up close and personal performance. Despite the wild speculation, the pair reiterate their plutonic status. Doing a split is hard enough when you’re just sitting on the floor. 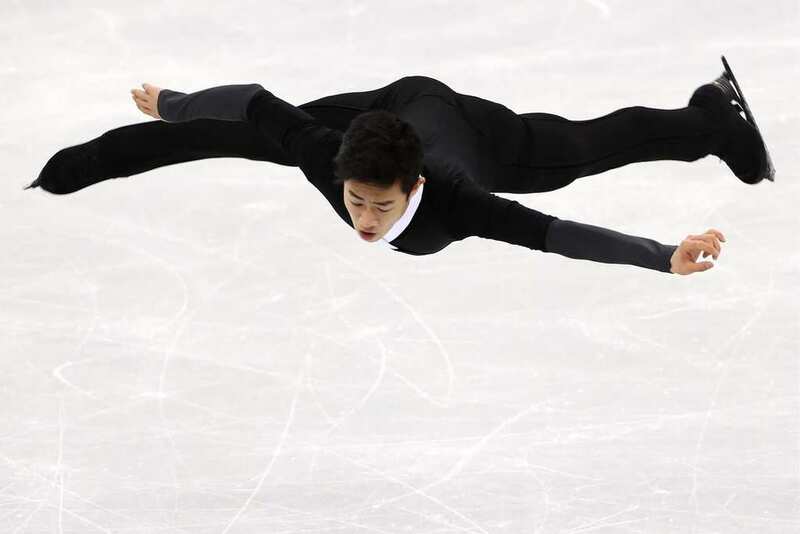 As far as Nathan Chen is concerned though, he can practically do them in his sleep, or in this case, whilst in mid-air. 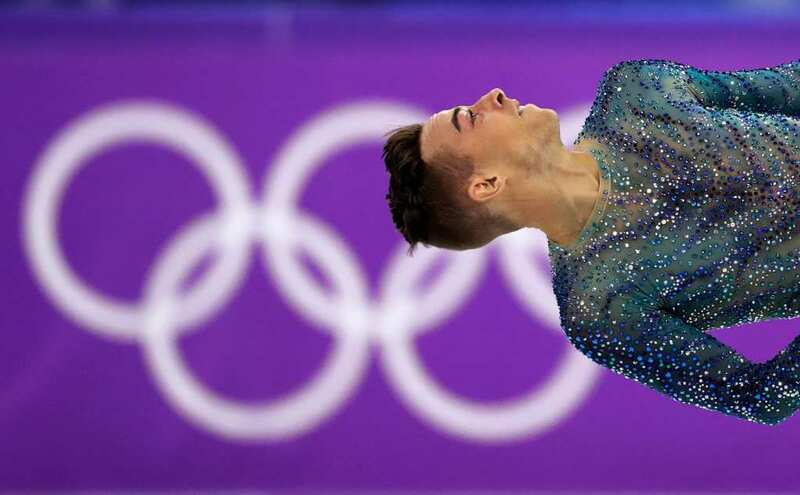 The 18-year-old, who is one of Team U.S.’s most promising young figure skaters in a long time, achieved an incredibly high score for his free skate. In the process, he set a record, with a staggering six quads. Despite missing out on the medals, his future looks extremely promising. It’s not just ice hockey that has its fair share of crashes, resulting in piles of bodies. 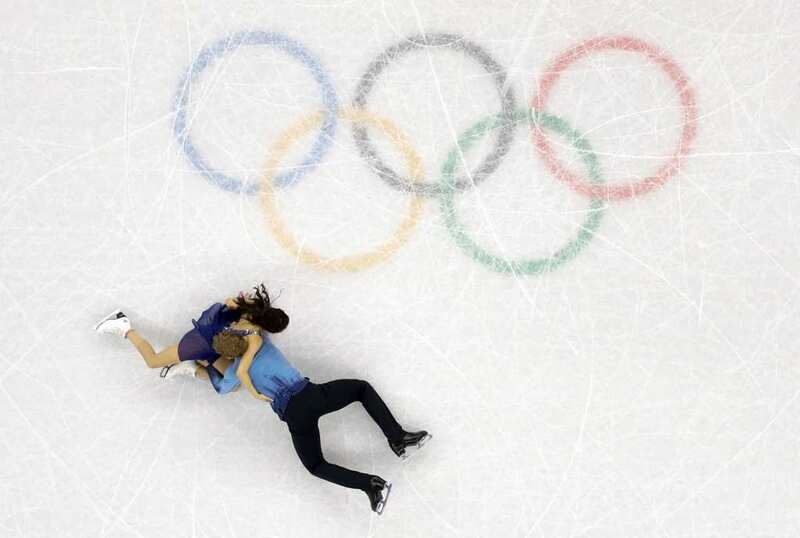 During the short-track speedskating 3000-meter relay, a trio of speedskaters ended up slipping and colliding with each other by the side of the rink. When you consider the blades they wear and their facial exposure, you can imagine that these skaters could get into a lot of trouble if they land the wrong way. Thankfully, these ladies came out pretty much unscathed. It seems like most people these days are constantly finding new and innovative ways to take the best selfie imaginable. Some go to the Paris and take a selfie in front of the Eiffel Tower. Others go to Winter Olympics in Pyeongchang. 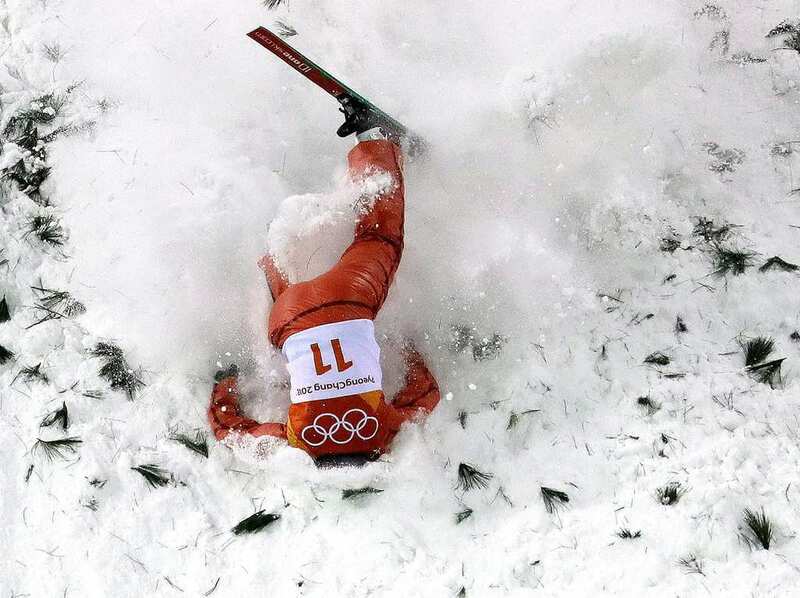 When Alla Tsuper competed for Belarus in the women’s aerials, she didn’t expect to be the centerpiece of one of the crashes of the tournament. Everything looked so promising. She was up in the air and ready to steal the show. Then, she misjudged the speed of her stunt and catapulted headfirst into the snow! Although it probably wasn’t as funny in reality, the photo that captured her error was absolutely priceless. She has truly fallen from grace since winning the gold back in 2014. These days, it seems like any time is a good time to take a selfie. However, if there is a time to take a selfie, it has to be when you’ve just won a gold medal at the Olympics. 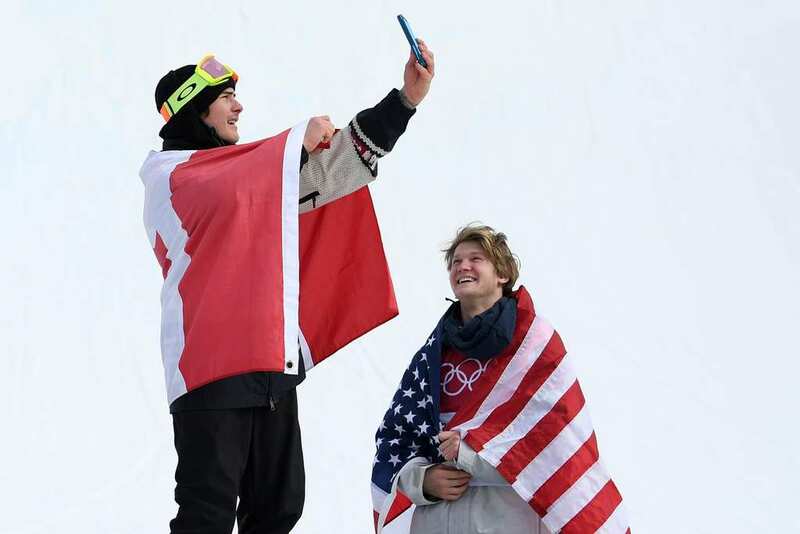 This is what happened when Canadian snowboarder Sebastian Toutant won the big-air contest. His friend Kyle Mack, who represented team U.S., was happy to watch, rather than take the photo himself. He was only able to get the silver. Even at the most critical of times in an Olympics event, a group of cameramen are ready at the helm to broadcast all the events, no matter how big or small, to the masses. 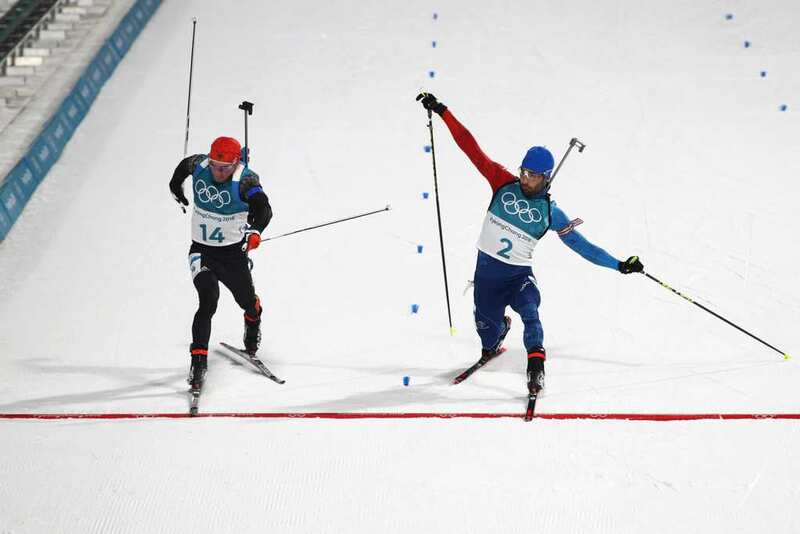 When Austrian skier Matthias Mayer fell to his doom in the middle of the men’s combined, a legion of cameras were hiding around the corner, ready to pounce. Come on guys, let the skier get up and make amends! He’s got some medals to win! “Watch out! I’m coming through” are the words that came out of Debora Pixner’s mouth when she leaped over her competitor during the quarterfinal of the ski cross contest. 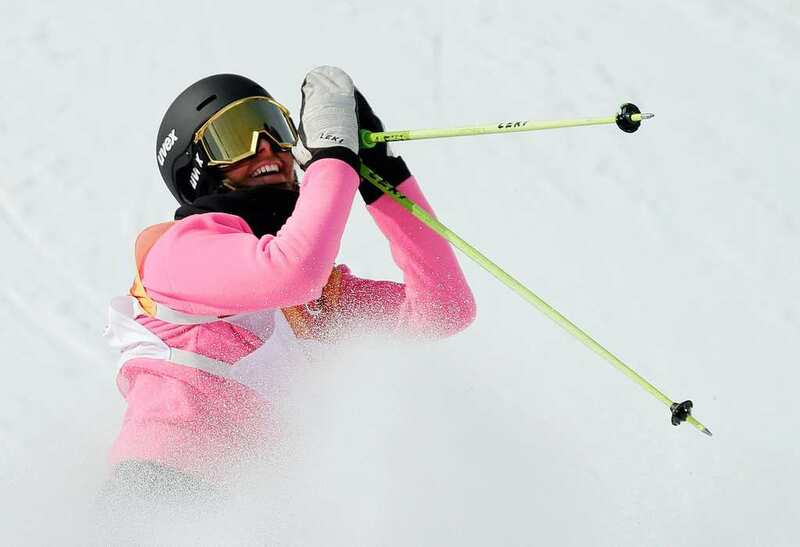 However, things didn’t work so well for the Italian skier as she crashed to her Olympic doom shortly after this photo was taken. Despite her failure in Pyeongchang, Pixner can be proud to have made a mistake look so spectacular in this particular photo. You could call it the ultimate frog leap! This photo perfectly encapsulates how great people feel when they win and how distraught they can become after losing. The man in the top right-hand corner who is still standing is Jan Mursak of team Slovenia. He scored the overtime goal that helped his team win the match against Team U.S. Both Donato and Zapolski can only hang their heads in despair after losing the game 3-2. In the end, neither team made it out of the group stage. 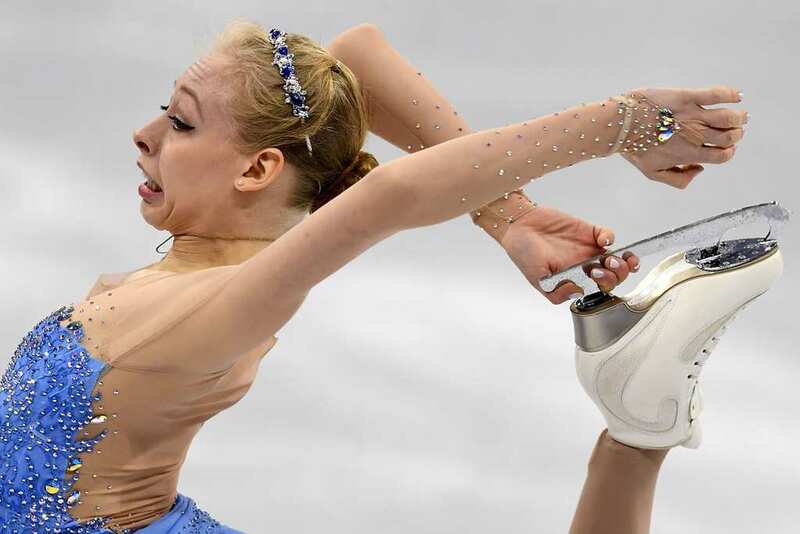 If there is one sport that is notorious for providing some of the funniest faces, it has to be figure skating. There are galleries upon galleries of photos of figure skaters who have been made to look silly simply for being captured by a photographer midway through a performance. The Winter Olympics in Pyeongchang was no different, with Chinese skater Li Xiangning falling victim to the most recent gang of photographers. She simply looks like she saw a huge spider! It seems like Canada’s Tessa Virtue and Scott Moir are just experts at pulling a funny photo! Sure, they won two gold medals this year, but in all honesty, we’re more interested in how they looked on the way to the podium! This image makes it look like Scott is holding on for dear life and just can’t handle Virtue’s weight despite years of practice with the same woman. Come on Scott, you’ve held her up in the air for so long! You know what they say, “no one ever remembers second place.” Sometimes though, it is hard to forget about that guy who missed out so narrowly on first place! It has happened on many occasions and happened once again at the Winter Olympics in Pyeongchang. When Simon Schempp won the mass-start biathlon for Germany, he was nearly beaten to it by Martin Fourcade, who was representing France. Just the narrowest of inches can be the difference between success and failure. This is a classic example of a photo that requires a bit of information attached to it to clarify what happened next. Unless you watched it live, you will have no idea. 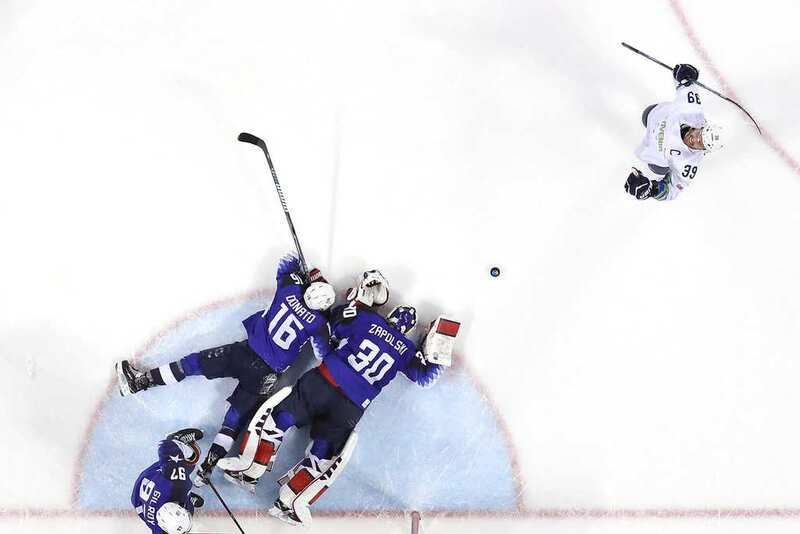 Maybe Canada’s goalkeeper, Shannon Szabados, saved the attempt of Team US’s Jocelyne Lamoureux? Maybe not. In fact, the opposite happened. Lamoureux took the puck, went up the rink and slipped it underneath Szabados. She scored the deciding goal that won Team US the coveted gold. Torvill and Dean, the Shibutani twins, Sale and Pelletier – there have been some truly great figure skating pairs over the years. American pair Madison Hubbell and Zachary Donohue certainly have the potential to be up there with the very best. Whether they will or not is still yet to be seen. One thing is for sure; they certainly have a lot of charisma and Madison seems confident enough about her performance that she even pulled a funny pose to cap it off. In life, there are many situations where we simply put our hands together and pray for what we most desire. You hear about those stories when even the most fervent atheists are facing a life-threatening situation and as a survival reflex, they begin to pray for something to spare them. 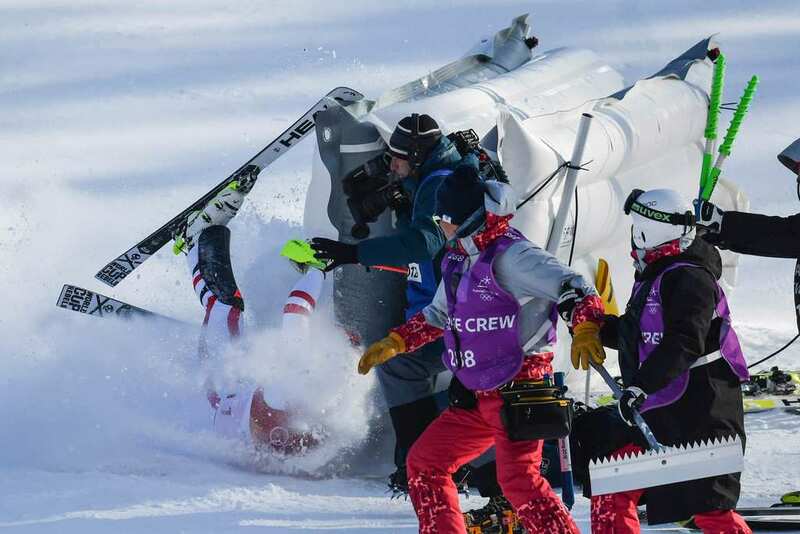 It seems like this is what happened with Germany’s Sabrina Cakmakli, who sincerely hoped that her halfpipe run would be good enough to win her a medal. It wasn’t. Do something long enough, and you feel like you can do it blindfolded. Confidence is an interesting thing. It can be a tool that helps you achieve incredible things. However, it can also be a curse, transforming into cockiness, and ultimately getting you into trouble. 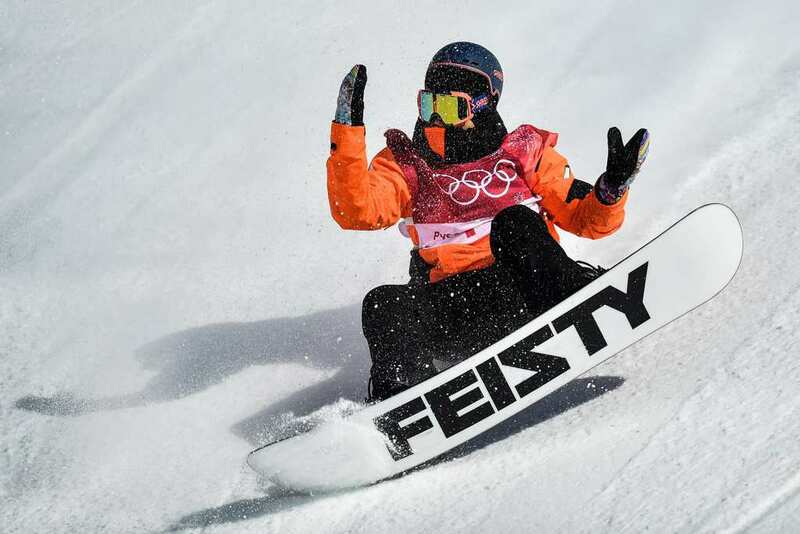 It appears that Dutch snowboarder Cheryl Maas is perfectly poised between the two virtues as she completes her big-air event with her hands in the air. A little less confident, or a little cockier, and she may have fallen off! Although the image looks relatively funny, the outcome was certainly not. 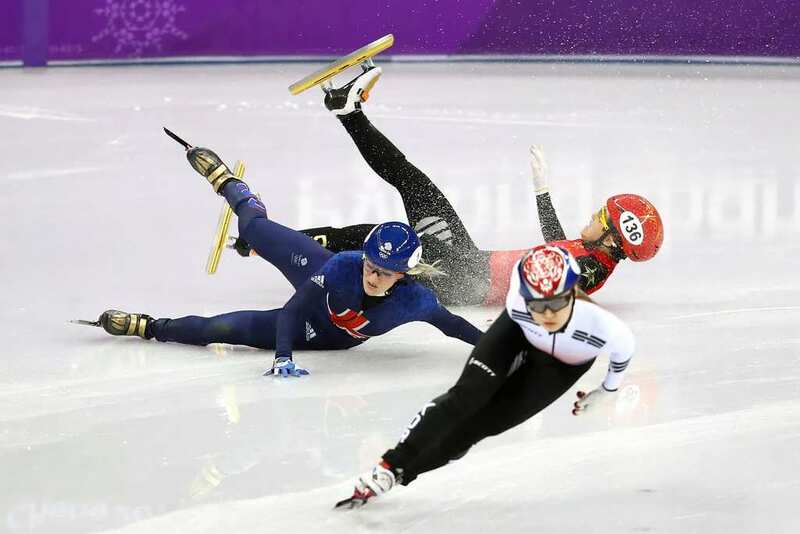 In the short-track semifinal, which saw many skilled speedskaters covering 1,500 meters, two contenders ended up prematurely falling. These were China’s Li Jinyu and Great Britain’s Elise Christie. Unfortunately, things didn’t turn out so good for the latter after this photo was taken. Christie couldn’t move after her slip and was forced to be taken off the rink on a stretcher. After finding out that she has made a full recovery, we can now laugh a little easier. Most people out there don’t know what it is truly like to win something. Out of all those people who finish first, there are nine other contenders who have to hang their heads in failure. However, Iivo Niskanen is one of those people who is not used to losing! 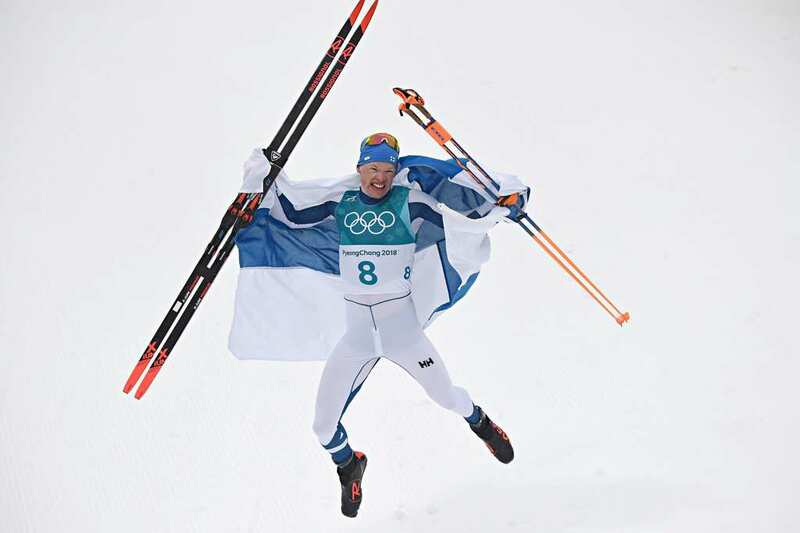 The young cross-country skier represented Finland at the Winter Olympics and ended up winning the 50-kilometer mass start. 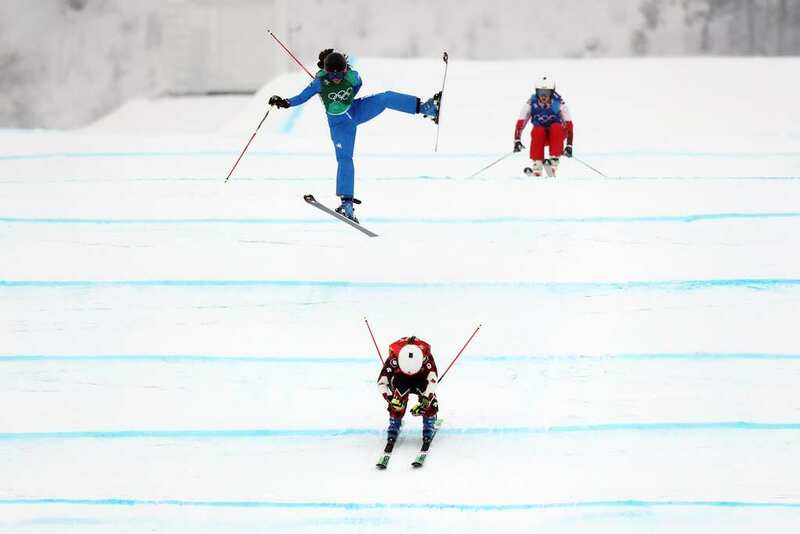 As you can see, he was compelled to jump with his skis when he found out he was victorious. 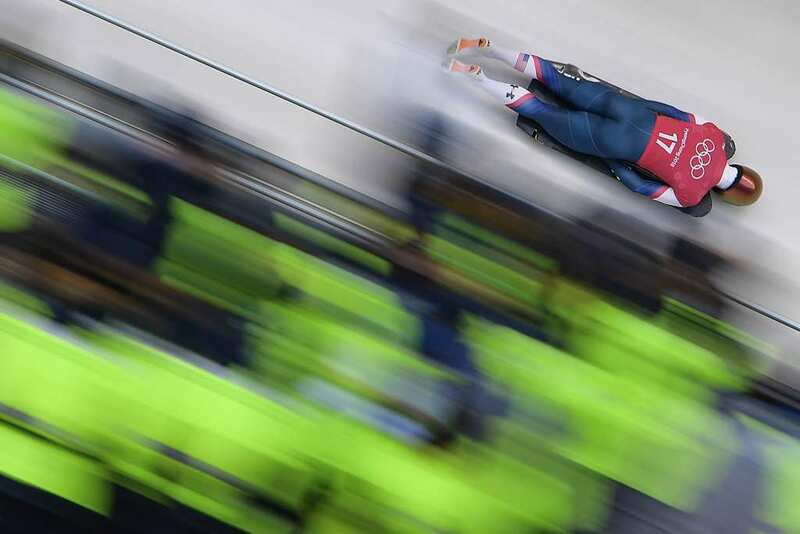 Team US’s John Daly moved so fast when he was practicing for the skeleton at the Winter Olympics that it created this crazy blurred effect in the photo! However, the American would ultimately be disappointed when not only did he miss out on the gold, silver, and bronze, but he also finished the contest in a miserable 18th place! It looks he probably should have saved his practice run for the main event. He was clearly going very fast! It seems like even before his free skate, Japan’s Yuzuru Hanyu knew that he was going to take home the gold during his time in Pyeongchang. This particular image fully captures the grit and determination demonstrated by the young man, who has already won so much in his short career. It looks like he is actually reaching for the stars. Or maybe it is a rope from the Olympic gods. They have thrown it down to him so that he can climb his way up to the glory. I Just Wasn’t Good Enough! It seems to be a recurring theme in this article that the photos either deal with winners or losers. However, what about those who won a medal, but not necessarily the coveted gold? Personally, we would be happy to win a silver or bronze. Any medal would do just fine! 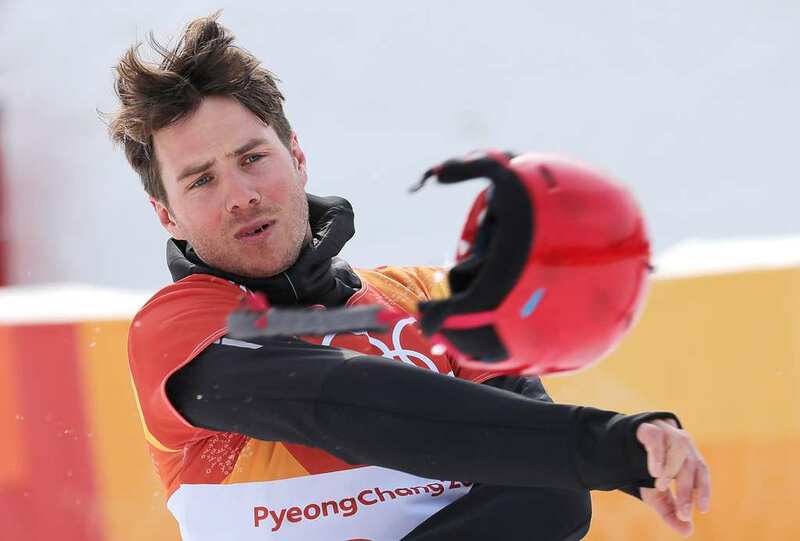 However, when Slovenia’s Zan Kosir won the bronze in the parallel giant slalom, his initial reaction was to violently throw his helmet to the floor. 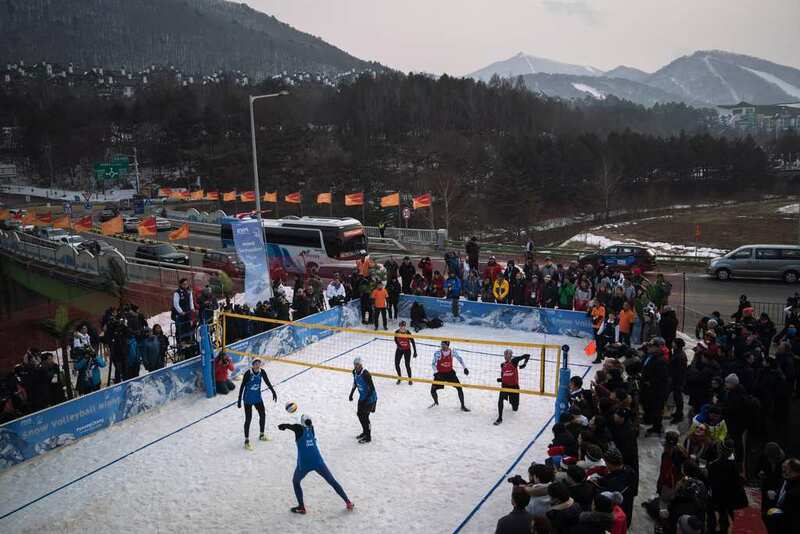 At one particular event at the Winter Olympics in Pyeongchang, people who drove along one of the roads were able to have a quick sneak peek of a snow-volleyball exhibition match! The games took place at the Austria House. We feel kind of sorry for those people who have paid to come and watch the game when all those drivers can watch it for free if they keep driving up and down the same road for the next hour! Like any race, expect things to get pretty intense between competitors who are all trying to beat each other to the finishing line. 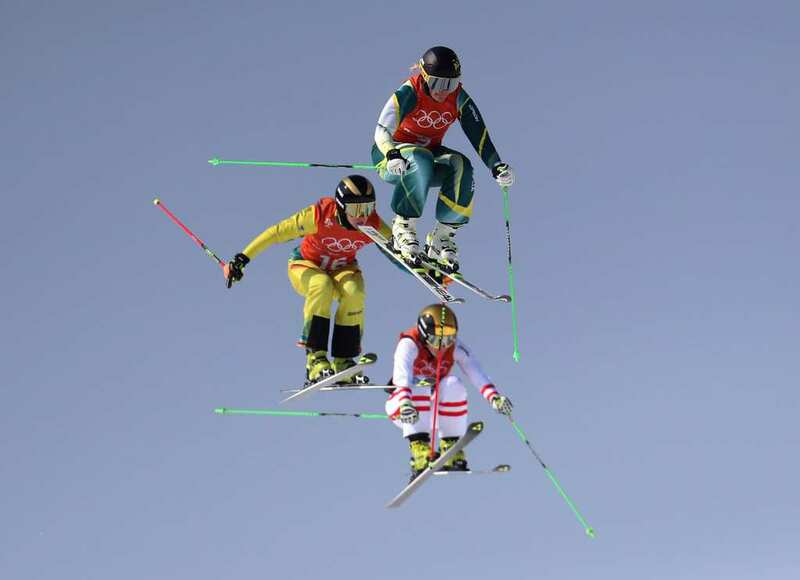 When it comes to ski cross, you can even expect to be on the heels of competitors when you are hanging in the air for a few seconds at a time! Even these individuals, who are practicing for the main event, are taking things very seriously. The second one better be careful; he’s about to get his teeth knocked out! Winning as an individual is obviously an impressive achievement. There’s just something special about working with a group of people towards a greater goal. 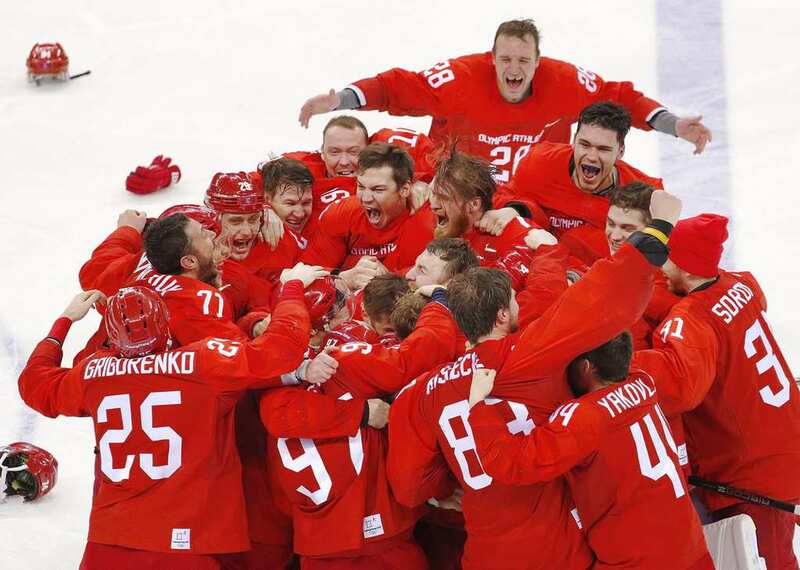 When the Olympic athletes of Russia united to topple the mighty Germans in a 4-3 overtime victory, you just knew that a bigger party was in the works. You can see it on each of their faces! So much joy and elation. All they need now is an unlimited supply of vodka and this could be the best night of all time! This courageous Korean women’s hockey team, which consisted of players from both North and South Korea, were forced to console one another after being eliminated by Japan. All that Lee Jingyu and Randi Griffin could do was hold each other after their dramatic 4-1 loss. 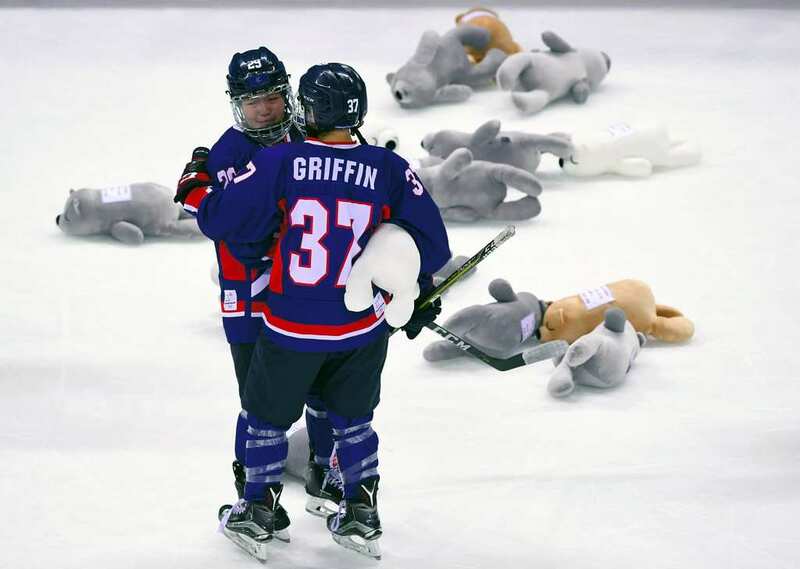 However, it almost looks as if they are standing in mourning of all the stuffed bears surrounding them on the ice. Although it’s a sad moment, the teddy mascots will inevitably make you laugh. Hi Mom, I’m On TV! It goes without saying, but the Winter Olympics is obviously one of the most broadcasted sporting events on the planet. However, this photo clearly demonstrates just how up-close and personal the cameramen can get to the heat of the moment. 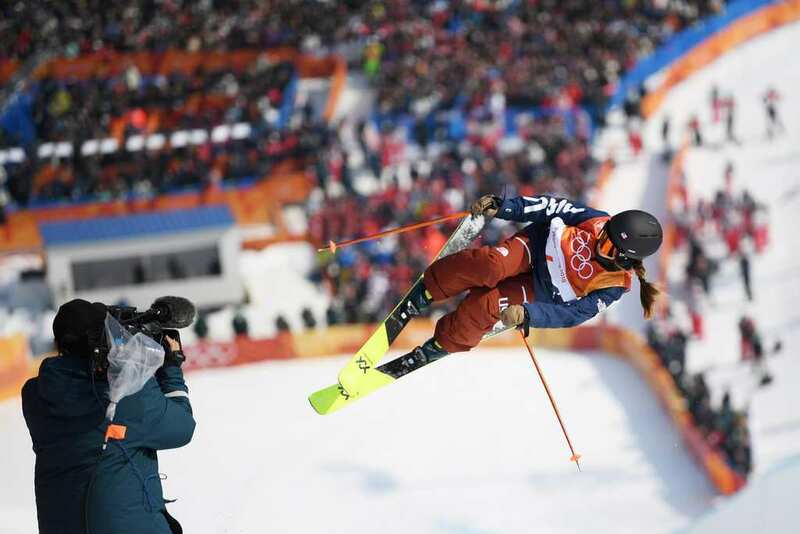 Skier Maddie Bowman, who represented Team US, saw one of her death-defying stunts get an extreme close up. 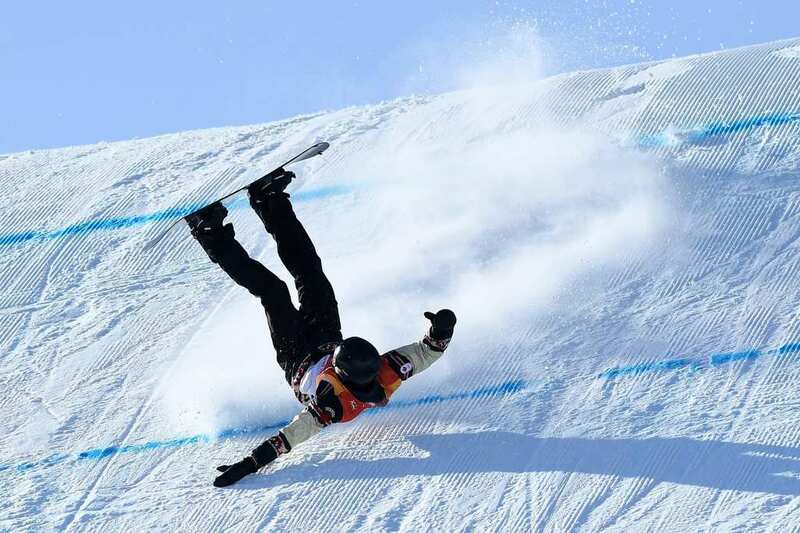 Although she won the gold back in 2014, Bowman was less successful in Pyeongchang, falling in all three of her finals. We are all aware of the intense rivalry between the United States of America and Canada, for a variety of reasons. This is no different when it comes to the women’s hockey at the Winter Olympics. When the two nations competed against each other in a preliminary round, referee Jenni Heikkinen was caught in the middle of an intense brawl. 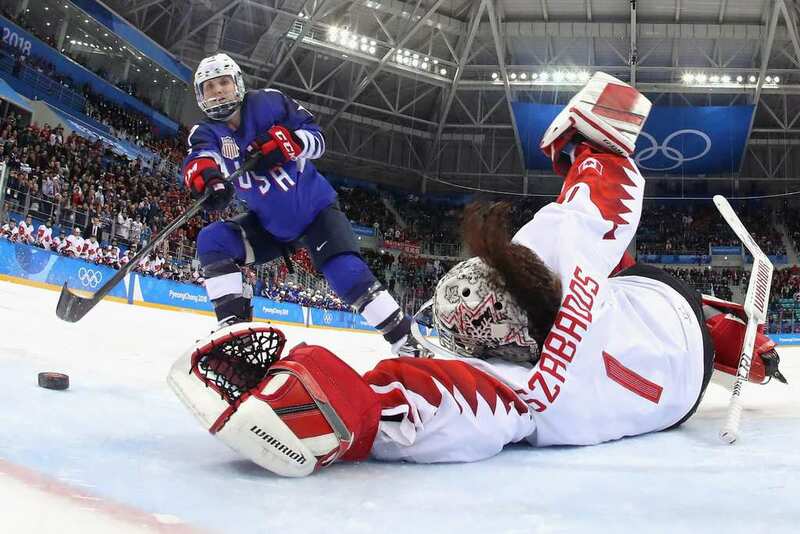 Although she eventually managed to split up the teams, Canada would go on to edge Team U.S. in a narrow contest, 2-1. Hockey, in general, has a reputation for being a rowdy sport. Breaking out into fist fights seems to be part and parcel of the game. If you’re not pulling at least a few punches in a hockey match, then you’re just not doing it right. 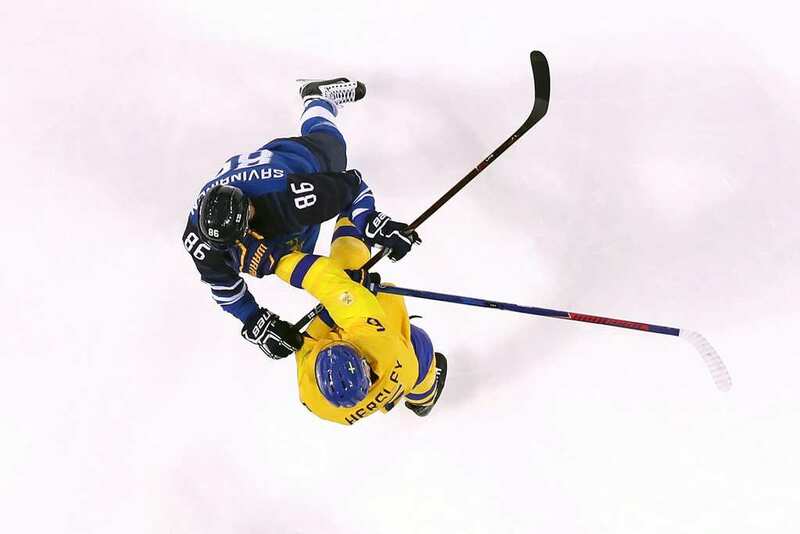 Take these two, for example, Finland’s Veli-Matti Savinainen and Patrik Hersley of Sweden, who got into a little fight in a preliminary. After the punches, Sweden went on to win the Scandinavian duel 3-1. 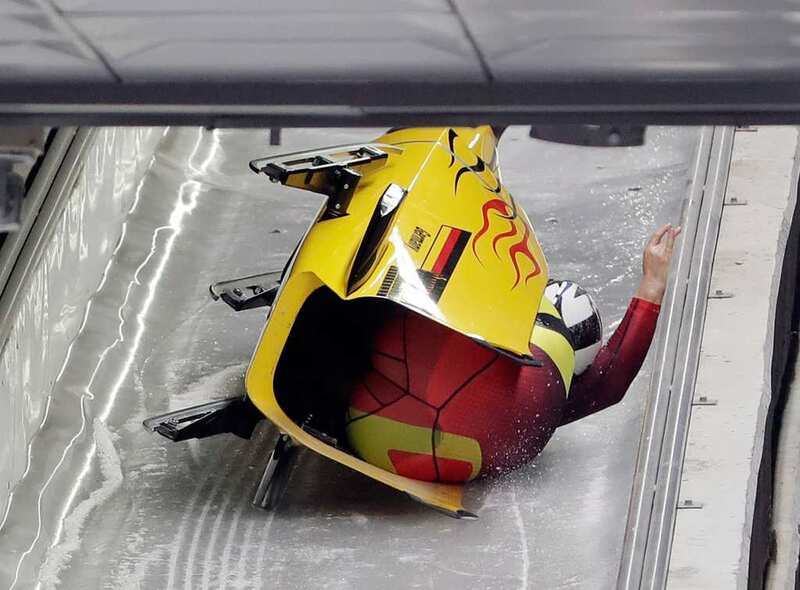 It should go without saying, but the German bobsled team failed to pull back after this epic crash at the Winter Olympics. Nico Walther and Christian Poser did everything in their power to try and get their bobsled back on track. You can even see one of their hands on the rails desperately trying to reclaim balance. Although it was a futile effort and should have been a devastating blow, the Germans went on to win silver anyway! We apologize if we should actually know the answer to this question. So if you have the answer, please send us an e-mail ASAP! With that said, the question is as follows: what on Earth does that “M” stand for? There is no denying that snowboarding is an extremely dangerous sport. The smallest of mistakes could cost you your life. Therefore, our hearts sunk when we saw this photo. It depicts Canadian snowboarder Max Parrot, who ended up falling and crashing when he was competing in the slopestyle event. Things could have gone really bad for the snowboarder. Despite this setback, Parrot came out of it unscathed and went on to win the silver after an impressive final run. The world is becoming smaller and smaller with each Olympic event. More nations than ever are getting opportunities to showcase their talents on the biggest stage in sport. 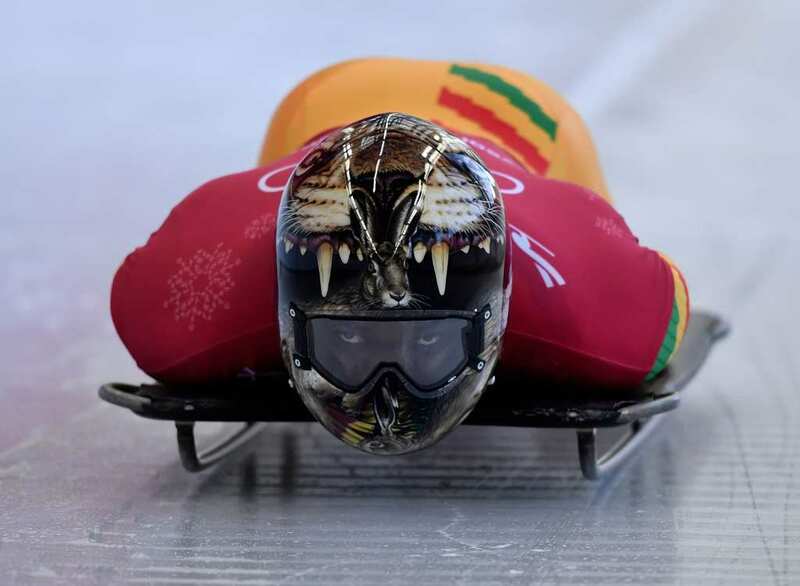 Take Akwasi Frimpong, for example, who became the first Ghanaian ever to compete in the skeleton event. After taking to the sport just two years prior, Frimpong had made it to Pyeongchang. However, it seemed like his flamboyant helmet, displaying a lion pouncing on a rabbit, overshadowed his actual performance. It’s obviously not just the women’s hockey that was riddled with fights and violence at the Winter Olympics in Pyeongchang. 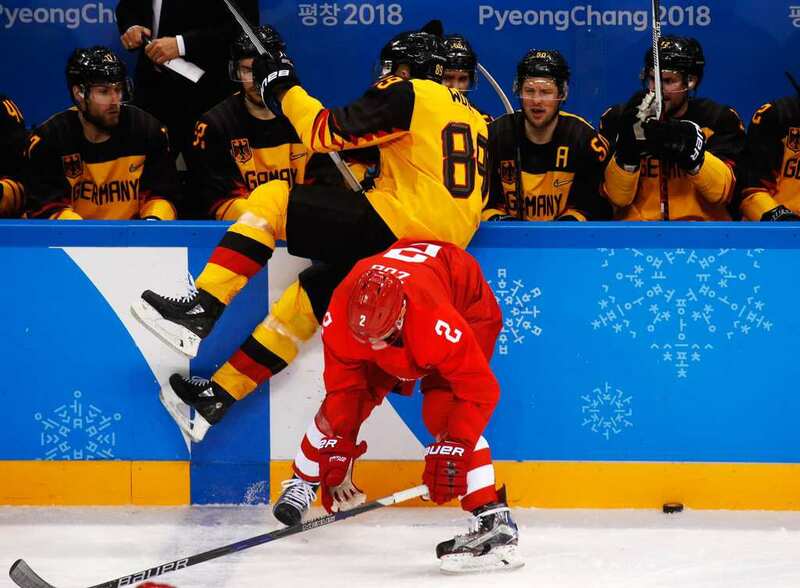 When Germany took on Russia in the men’s final, all hell broke loose when Russia’s Artyom Zub body-checked David Wolf of Germany. However, Wolf ended up flying against the edge of the rink, which did not please his teammates in the slightest. In the end, the Olympic Athletes from Russia beat Germany 4-3 after the game went into overtime. Adam Rippon has been one of the most promising figure skaters in recent memory for Team U.S. 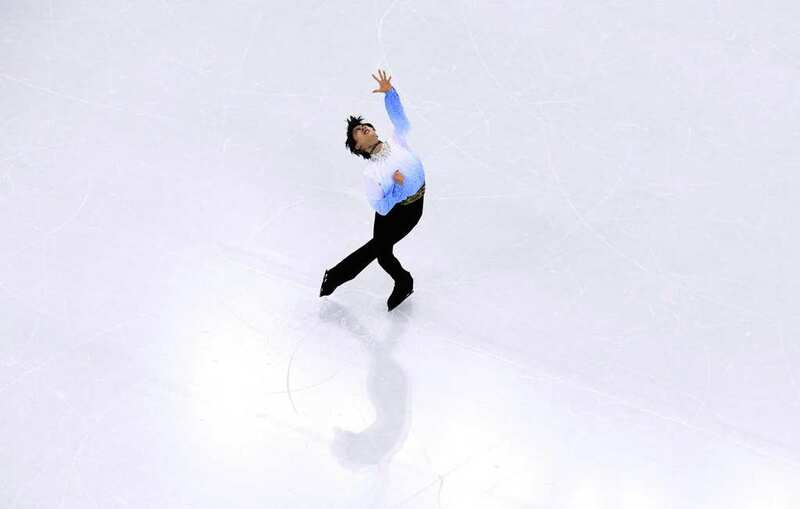 However, his performances at the Winter Olympics in Pyeongchang left a lot to be desired and the experienced skater ended up finishing 10th in the singles. Although he didn’t put a foot wrong during the competition, there were just too many better performances from other competitors. One thing is for sure: this photo of Rippon in mid-air is pretty trippy.